One of the great benefits of being a cigar blogger and event host is that I get to try great new products and meet the people behind them. Casta Cigars is one such brand. In February of 2018, we hosted a great pairing event featuring Casta Cigars and Ardbeg Single Malt Scotch at the Carneglie Club in Manhattan. We heard great feedback on the cigars so it only seemed natural to get some of the backstory in the form of an interview with Jon Kindig, the co-founder of Casta Cigars. MC: Alright Jon, let’s start with the basics. Where are you and your family originally from? My family is Swiss German. We received a land grant from William Penn and settled in Lancaster Pennsylvania in the late 1600’s. MC: How long have you been a part of the cigar industry, and what brought you in? JK: I have been in the cigar business for over a decade, and have been smoking cigars for almost 30 years. I owned a mid-sized HVAC business in the 2000s, and when the mortgage crisis took a toll on my business, I decided it was time to move on. I was in my early 40’s and was trying to figure out what to do with my life. A childhood friend said “ Jon, you love cigars, why don’t you make your own cigars. ?” Having a huge passion for cigars, I thought ‘why not?’ My great great grandfather Alvin DeLong grew tobacco for a living in the Manchester area of Pennsylvania. So I guess tobacco is in my genes. MC: Was there a particular moment when the opportunity of owning your own cigar brand was presented to you, or did the idea develop over time? JK: As I mentioned above I was ending one career and looking for the next. And wanted to do something my heart was in. And thought no one currently using rare tobaccos. And the emphasis on cigars lately seems to have gotten very commercial. I realized there was an opportunity to use great tobacco to make small batches of cigars. Even though we’re considered a “boutique brand” I almost like to think of our cigars in the fashion of micro brews. We use better ingredients, charge a little more, and generally provide a better smoking experience. MC: Are you a full time cigar brand owner, or do you have other work that you do alongside running Casta? JK: Cigars are my full time gig. While living in Dominican Republic learning all I could about the cigar industry, I was approached many times by experts living there. And asked If I could repair or install systems, Air-conditioning systems. My reply was always the same. I could, but that chapter of my life was finished. I was completely dedicated to creating the best cigars. MC: Where does the name Casta come from? Tell us a bit of the backstory there. JK: The name Casta translates from the Spanish word casta, which means breed. I thought yes, good word, cigar smokers are a certain breed of people. My family, also was in the horse business for many generations. We provided the horses and Clydesdales that were hitched to the Conestoga wagons that took the settlers out West. We had many thoroughbred horses. And in my mind I like to think of our cigars as thoroughbreds. MC: In an industry that experienced a boom in the 90’s and a continuing renaissance on the boutique brand side, what sets Casta Cigars apart from the major brands? JK: Casta Cigars is focused on providing a great smoking experience. Cigars are a passion for us! I wanted to set us apart from everyone else. Especially when the cigar industry seems stuck in time to a degree. I wanted to bring a fresh new vibe to the industry. We want to to appeal to the modern and younger cigar enthusiast “millenials” who are looking for eye appeal and honest straight-forward information. We also want to appeal to the traditional cigar smoker. 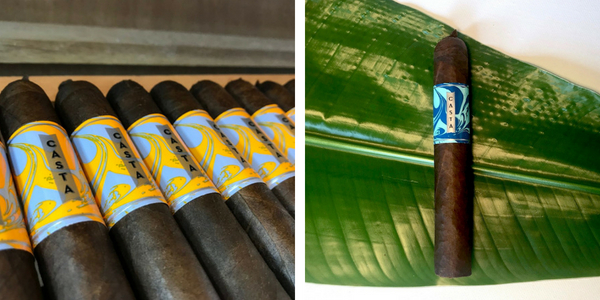 Everything about Casta breaks from the cigar “norm”, from our bands to our packaging and our goal to stay as green as possible. For example, no wrappers, recycling boxes instead of sending them to a landfill somewhere, and promoting humidor use. The serious smoker should always have one. MC: Your website describes Casta Cigars as something of a small-batch minded company. Why have you decided to keep production in limited runs? JK: Our goal was never to be the biggest cigar company! Again we like to consider ourselves the micro-brew of cigars. Small batch, high quality, awesome smoking experience. That’s a hard standard to maintain in itself, especially when you get too big. MC: Another interesting part of the story is the ages of the tobacco that you are working with. Your website claims the tobaccos in your cigars are aged upward of 15 years. How did you come by such rare tobaccos? JK: Our fifteen year old Brazilian tobacco was introduced to us by Lancaster Leaf Co. (correction all our tobacco is all 15 years aged). When I explained to them that we wanted to be different and use something that no one else in the industry is using, they introduced us to some rare tobaccos (most of which are not currently being used by other cigar companies, primarily because of cost and availability). Differentiating ourselves from everyone else was absolutely the way to go. I feel a true cigar enthusiast will pay little more for something that is unlike anything they’ve ever smoked before. The 75 year old tobacco came from Domestic Tobacco of Lancaster, Pennsylvania. Geoffery Ranck (owner of Domestic Tobacco) was a personal friend of the family. I mentioned to him my desire to produce high quality, small batch cigars in the Cuban fashion. He told me that in one of his tobacco warehouses he had the perfect tobacco, which his father had purchased. The rest is history. MC: Any last thoughts for our readers? Yes. Please support the fight to exclude premium cigars from “the end of cigars” legislation! Today, I’m interviewing Craig Vanderslice of www.cigarcraig.com. Cigar Craig is one of the first blogs that I started reading when I started smoking cigars in the late 2000’s, and it’s a website that takes a down-to-earth approach to cigars. In my interview with Craig, we discussed how he first fell in love with cigars, how he keeps up with the work of running a cigar blog, some of his favorite posts ever, his favorite cigar bloggers, and more. MC: Let’s kick it off with some standard background. When did you start smoking cigars, and why did you start your blog? CV: I started smoking premium cigars around 1995. I had been enjoying cheap cigars every Friday at lunch with a coworker and it was the cigar boom of the 90s so we decided to see what the big deal was with a premium cigar. We bought some Macanudo Hyde Parks and smoked them and got the bug. I don’t think I went back to the Garcia Vegas and Backwoods after that. Around the same time I was getting into the whole internet fad, and did some cigar research and found a cigar newsgroup on usenet, which was the ancestor of forums and Facebook basically. I ended up participating in that for ten years, travelling all over the country to attend herfs (the term “herf” was coined by that group, it’s taken on a life of it’s own) and met a lot of great people. Steve Saka and Christian Eiroa were contributors at the time. I got tired of the demeanor of the usenet group around 2006 and stopped contributing. In 2009 my wife bought me the cigarcraig.com domain and I decided to start a blog as my creative outlet. It started very rough, but after taking my first trip to cigar country in 2011 it started getting visits and I settled into a regular schedule. I’m proud to say that if you search for “cigar blog”, “cigar bloggers” or just about any permutation of that in any major search engine, CigarCraig.com places very high in the results, in many cases the first result. I believe this was just a result of consistency and using appropriate keywords. MC: Writing a blog takes a lot of work on a weekly and sometimes even daily basis. What’s kept you motivated to keep your blog up to date all these years? CV: I spend much more time on research than actual writing! I like to think my site is a blog in the purest sense, it’s a web log of my cigar journey. This can be a recap of the cigars I’ve smoked, store visits, events either at stores or festivals, interviews with industry people and celebrity cigar smokers (it’s been a while since I’ve done a celebrity interview, working on that), and accessory reviews. Lately I’ve been sharing more press releases verbatim, while I have the time on my hands to do it. I should actually write an article based on the press release, but I’ve been taking the lazy route. I think it’s the variety that keeps it from getting boring, both in the industry and with my personal style. Also knowing I have a faithful readership that, for some reason I can’t fathom, looks forward to reading my nonsense! I deeply appreciate all those who choose to waste their valuable time reading, so I often have contests to reward the loyalty, or just send random stuff to people, it’s fun to share. So what keeps me going is the interactions with the readers, having the opportunity to smoke new cigars and play with new accessories, and having sponsors who believe enough in what my site does to support me. MC: What’s your favorite post on CigarCraig. Either one you feel the most proud of or that you’ve gotten the best response from readers on? CV: Oddly, a post I wrote on my travel to Reykjavik, Iceland (linked here) about cigars there has been getting daily visits for the last year and a half. It comes up first in Google searches for cigars in Iceland, I guess the fact that there’s one shop in Reykjavik and no discernible cigar culture so there haven’t been a lot of articles written on the subject. Probably the post I’m most proud of for the writing and the comments and discussion it produced goes back to 2012. I was frustrated (and remain so, not too much has changed!) with the IPCPR and wrote what I think was a well reasoned rant on the subject of “new media” being members and attending the trade show. The comments were from a who’s who of media, manufacturers and retailers. It was some of my best work, I think and it did lead to some changes for the better with the trade organization, although, six years later there are still IPCPR members who would rather not see bloggers at the show. It’s mystifying, and I’ve chosen no to be a member any longer as a result. MC: Are there any other cigar blogs that you read or find worthwhile? CV: I have had the good fortune of meeting many fellow bloggers and cigar media types, and consider them friends, so this is a loaded question! Certainly Halfwheel and Cigar-Coop are outstanding resources and come up in a lot of searches when researching specific cigars. While I don’t regularly visit a lot of other blogs, I check in to a bunch from time to time. Most of them offer a unique perspective. Some do a great job of reviewing cigars, others excel at presenting news items and everyone has their place. There are some that go off the rails a little I think, but overall there’s something for everyone out there. MC: “Off the rails a little.” I love it. I’ve certainly seen some of that firsthand and far from being frustrating it’s mostly just entertaining to watch. Let’s talk about the brands. In your time writing about cigars and meeting industry reps, you’ve likely had a chance to see a lot of companies fail and succeed. What in your mind is the ingredient that makes a successful brand in the cigar world? CV: Great question! Today I think the brand owner or ambassador or manufacturer has to be personally involved at the retail level. Rocky Patel set the standard and has had pretty good success. Omar de Frias followed Rocky’s model and his Fratello brand enjoys a lot of success. Perhaps just being engaged with the consumer via social media is enough as long as the product is spectacular, in the case of RoMaCraft. Cromagnon started out being available largely through Skip Martin’s Twitter engagement. When Ernesto Carrillo launched EPC cigars his website was basically a map with tweets mentioning the brand popping up from wherever in the world they originated. We have an unprecedented level of interaction with the principles in the cigar industry, and I think that reinforces a lot of brand recognition. I know, whether it makes sense or not, I enjoy cigars more when I have a personal relationship with the people who make the cigar, or are responsible for the blend. MC: Man, that’s so true. I had a similar experience recently with Sans Pareil / La Instructora cigars. For a while I had been pretty skeptical, even after reviewing the La Instructora Box Pressed No 2 and enjoying it. But after meeting Aaron Saide at one of my private tastings and enjoying two hours of conversation with him, I experience his cigars in a completely different way (I’m still sitting on four or five unreleased La Instructora blends). In any case, we’re at that point in the interview where I’ll go ahead and ask that most important and most hated question: what are your top two or three cigars? You know, the cigars that continue to blow your mind year after year, even after smoking dozens or more? CV: There are a handful of cigars that I never tire of and pick up when I need a “sure thing”. Padron 1964 Anniversary Exclusivo, Fuente Hemingway Classic come to mind as cigars which are as tasty and satisfying today as they were 20 years ago. Drew Estate’s Nica Rustica is a go-to also, I love the no nonsense, straightforward flavor of this, and similarly the CAO Flathead. Over the last years or so I’ve defaulted to the Cornelius and Anthony Cornelius Toro for a special occasion smoke. It’s a refined and complex medium bodied cigar. MC: Ah man. I’m so with you on Cornelius and Anthony. They make phenomenal cigars. The Daddy Mac is in my top 25 of all time for sure. Let’s send our readers off with something fun. What’s a fun fact about cigars or the industry you have in your back pocket that you think my readers would be surprised to learn? MC: that’s definitely a fun fact! For all of my readers here – you’ll get many more fun, quirky insights on www.cigarcraig.com so don’t forget to visit the site and subscribe via email. Craig, thanks for taking the time to share about yourself and your work on www.cigarcraig.com. I’ll start off here by saying that interviews aren’t a common thing here at Fine Tobacco NYC. Generally they’re a bit tedious to put together and I’ve often found reading interviews that they can at times be extremely long without saying much of value. In the case of Gene Kizhnerman from Taste the Dram, though, the interview makes a bit more sense because he is knowledgeable both about spirits but also about the business of owning and maintaining a blog (and a blog that I regularly read). So for those readers here who have considered starting a blog or some kind of review site but haven’t gotten around to it, this interview could give you some insight into what it takes to run a blog, particularly in the spirits space. All that out of the way, let’s get on to the interview. Alright Gene, I’m going to do my best to avoid completely generic interview questions, but we’ll see how goes. Let’s get the complete basics out of the way. Where are you from, and what is Taste the Dram? I am originally from Moscow, Russia and I came to the United States as an immigrant refugee when the USSR fell apart with my family back in the early 1990’s. Lived in New York ever since. Taste the dram was something that I started a few years ago when I first fell in love with my girlfriend Rebecca. Before Rebecca I had a major hatred for anything whisky related. From nightclubs to shots of Jameson and Johnny Black, I had no idea what good whisky was all about. I had this notion that you just shoot it fast and hold your breath. Long story short, I met Rebecca and on our first date we spoke about her love for whisky. Particularly the Balvenie 21. Now as I stated before I thought I hated anything whisky related, but here I was, trying to impress this girl. Our second date I took her to the Flatiron Room (this was the place known for whisky). At this point it was still very difficult to enjoy this spirit. It was harsh and spicy and just too much for me to handle. On our third date, a friend recommended we check out a local bar restaurant in our area called Wheated. I think this is where Taste the dram was officially born. We met the owner of the bar and he was very knowledgeable about the spirits. He recommended I start off with a lighter approachable Japanese Whisky, the Yamazaki 12. At first sip, I thought to myself, wow yea, I could enjoy this. Then something crazy happened. An ambassador for Laphroaig and Beam Suntory walked into the bar and happened to be good friends with the owner. Out of nowhere he heard my story of being new to whisky, and bought us a round of the Bowmore 25 and the Auchentoshan 21. When I tried these spirits, I was blown away by the complex flavors and the robust profiles of the whisky. You can say I was hooked from the first sip. Taste the dram is an online digital magazine that features spirit reviews, interviews, and spirits related lifestyle. Why did you start Taste the Dram? So Taste the Dram started more as a hobby. I started an Instagram and started posting the whisky I was tasting at Wheated and other whisky related establishments. From there a few months later, I began my website Tastethedram.com. I thought people would appreciate the reviews of whisky I was putting together, and make their ordering whisky at the venues more approachable. I wanted there to be a real website with real reviews. A lot of these blogs have whisky reviews but they post photos they find from online websites. So there was no real way to tell if they truly tasted the bottle they are reviewing or just making stuff up. From there it kind of took a life of its own. I began to reach out to distilleries and venues and other spirits eventually. And I noticed people really reacted positively to the stories we were offering. So we just kind of kept it going. As someone who writes my own blog, I know it can take a lot of work to keep content rolling. It gets even harder when holidays roll around or life stuff comes up. What keeps you writing and producing content day after day? I have turned this into my passion and something I truly enjoy. Also I get a lot of great feedback from my readers and followers and I know I cannot disappoint them. I try to keep the content fresh and not repetitive. There is a lot of work that goes into the articles we write. Usually we have to meet with the companies or persons we are interviewing. We prepare a detailed list of questions that pertain to their business. We then record the entire conversation, which sometimes consists of hours of work. Then we manually retype the recording, edit, add photos and post. Sometimes one interview from conception to execution can take 5-7 days. It’s a time consuming process. But it’s well worth it. I’ve had a few readers write in and ask how they can get started with their own blog. What would some of your tips and recommendations be for someone looking to convert their passion for whisky into a blog? I would say do it because you want to and not because you’re expecting to get money from ads or get free things out of it. Sure over the last year, we have been invited to attend and do coverage of many events at no cost to us and we have been sent free bottles. But let me tell you, it takes a lot of manual effort on our end, which pays for itself. Content is key. You have to figure out how you will stand out from all the other blogs. Everyone has a niche. For me personally I try not to compete with the other whisky blogs out there. I simply cannot. I do not have the resources or the man power. I am a one person show. That is why I try to bring the content that I feel is both engaging and interesting and I will not have much competition from other blogs. Lastly you really have to enjoy to write. As you know Matthias SEO is big in getting more and more readers to your site. And writing 2-5 sentences and keeping it brief will not build you any engagement. Also consider you will be paying for the domain, monthly hosting and other expenses. You almost have to enjoy writing as much as you enjoy breathing to have any type of success in this industry. Let’s switch gears a bit. In the course of your work, you’ve met a lot of people in the whiskey industry, from established brands like Macallan to smaller boutique whiskey companies. Given what you’ve seen, what would you say the ingredients (or mashbill in this case) for a successful whisky company is in 2018? Great question Matthias. There are probably over 2000 craft whisky distilleries in the United States alone. Even more globally. Then you have the big brands like Balvenie, Macallan, Lagavulin to name a few. Then the international market has made a huge push into the whisky market with spirits such as Yamazaki hailing from Japan, Kavalan from Taiwan even Paul John or Amrut from India. To be a successful whisky company in 2018, I think you need to have the following formula. Create a quality product. This means that if you are a craft distillery don’t just start pushing out 6 month or 1 year bourbon or rye for instance. It’s going to be very hard for you to compete with shelf space with some of the bigger well known players such as Michters or Elijah Craig. Also, don’t just go into the business thinking you will be a millionaire. We have interviewed so many small craft distilleries, and most have done their homework and worked for another distillery and learned the craft. They sit on their products without seeing a profit because they want to release a 3-4 year aged product instead of white dog whisky. Don’t try to expand too quickly. Make sure you are well known in your area where the whisky is made. If you make whiskey in NJ, don’t go for distribution in California. Make sure you’re the top distillery in NJ and NY and other surrounding states. Do not try to be like everyone else. IF you do, you will fail before you even get started. Be different. Social Media is huge! Social media allows whisky companies to reach a major demographic of potential buyers of their whisky. Build your social media presence and find the right platform that gets you the most visibility. Build relationships, go to events, make your product visible and known. Also do not price gauge to make a profit initially that will turn the customers off in the long run. There’s a reason some of the big companies like Macallan are the brand everyone knows about. Macallan does not spend money on marketing or billboards. When you make quality products at an affordable price, people will take notice. Ok let’s talk favorites. What is your favorite core line single malt, and what is your favorite hard-to-find whisky that you’ve had so far? Oh man so many here for me. Favorite core line single malt is the Glenfarclas 17. At $99 retail this 17 year old is a true sherry bomb. I personally love anything finished in Oloroso Sherry cask. I feel it brings those inviting notes of toffee, dark chocolate and honey. Another great one in that price range is the Aberlour A’bunadh. Cask Strength sherry bomb, just cannot go wrong. I’ve been fortunate to have had a lot of hard to find whisky, but I would say the once that stand out is the Rosebank 21 year old, Scotch Malt Whisky Society 71.42 Sinbad Preparing for a Journey – this whisky tastes and smells like salted popcorn. Lagavulin 1985 – 21 year old single malt bottled at cask strength was phenomenal. What is one post on your website my readers should drop everything to read, and what is it about? We’ve had so many over the years that it’s pretty hard to choose just one. But if I had to I would say check out the interview we did of a whisky influencer on instagram Nate Woodruff aka @Whiskywithaview. Nate is one of those guys, former brand ambassador that is just a breath of fresh air. People see these instagram influencers as just someone who gets free things from whisky brands. But no one sees the hustle or the sacrifice it takes on the backend. I think Nate is a great example of what it takes to be a whisky influencer, and just a general whisky lover. I have a lot of respect for anyone who can curate a beautiful Instagram or Twitter account in the whisky world. It absolutely takes a lot of time, hard work, and attention to detail. What’s the most surprising or even shocking thing you’ve learned about whisky, or the whisky industry, in the time that you’ve been writing? Nothing really too shocking just my personal observations. There are some craft distilleries out there that just started out because they thought it would be cool to make whisky. They had no prior experience or knowledge of the process. Their whisky actually tastes pretty awful and expensive for what it is. I will not mention which distilleries I am speaking of in particular but there are quite a few. The one thing that I’ve always had an issue with in the whisky industry was the lack of women. Women have a better sense of smell than men biologically and are some amazing bartenders, distillers, ambassadors even spirit distillery owners. I wish more people interviewed these powerful and upstanding women of the industry. We have interviewed a numerous amount of women in the past that have contributed to such a major growth of the whisky industry as a whole, and we will continue to support them. Some of the best most outspoken and knowledgeable whisky ambassadors are women, to name a few Jordan Zimmerman (@jzimmerman_tx) formerly of Highland Park now works for Jura and Dalmore. Amanda Victoria (@ladyamandavictoria) from the Scotch Malt Whisky Society, Tracie Franklin (@glenfiddichtf) to name a few. Thanks for taking the time to share your knowledge and experience, Gene. Where can people find you online and on social? Thanks Matthias for doing this interview, I am really humbled by it. I am pretty active on instagram @Tastethedram and also my website Tastethedram.com has a lot of really interesting content. We have some impressive interviews coming your way soon. We have Interviews with Global Brand Ambassadors for Highland Park and Macallan, a few new craft distilleries, a few international whisky brands and local whisky/spirits restaurants around NYC, among many more in the near future. During one of our cold and dreary winters here in New York I invited some close friends to my house for a grueling task. I wasn’t asking them to move furniture or paint rooms which are the archetypal favors you may rope a friend into. No, this was a “chore” most mates would jump at the chance to aid in. 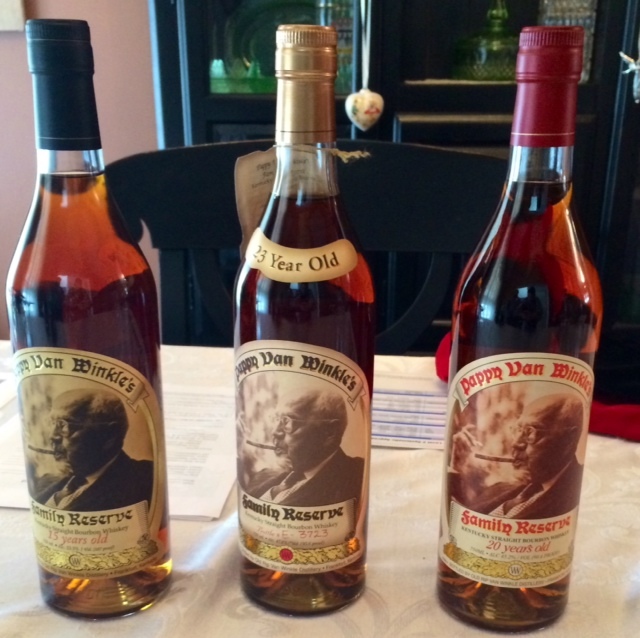 The call I placed was to ask if they would assist me in rating a vertical of Pappy Van Winkle 15, 20, and 23yr. old bourbon. Needless to say both friends didn’t seem to mind lending a hand or their taste buds. However in order to gather sufficient and comprehensive results I had to put a few key methods into place. First I chose these two friends for particular reasons. Although I had many people offer to “help” out with my study I felt I needed some specific tasters. One of them has tasted many a fine bourbon yet still considers his tasting acumen as” budding” and continuing to develop. Also this individual doesn’t covet any booze or cigar and price and/or hype never sways him. I can always count on him for an honest assessment and he is one friend who even keeps me grounded at times. The other person has never tried bourbon but is a big fan of wine with a developing palate enhanced by his extensive Sommelier certification coursework. He is an asset to the study as he has the ability to recognize taste but no preconceived notions on what bourbon should be. Second we had to do this study blind. In order to score without bias we needed to NOT be aware of what we were drinking. 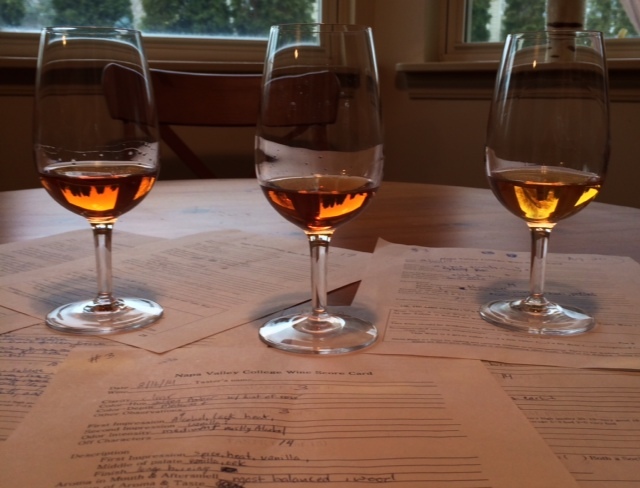 Each bourbon was covered up by someone not participating in the study and each bottle labeled simply 1, 2 & 3. We were poured each one in number order and utilized the UC Davis College Wine Score Card which applies to spirits as well. This card has a point system broken up into 3 categories with a scoring system for each category. The categories were Appearance, Odor, and Taste. Each category was noted and then given a score. The scores were then added up for a final scoring on that particular spirit. The highest total score that can be achieved is 25 points on the UC Davis College Wine Score Card respectively. The results and ratings below are listed highest to lowest scored with tasting notes as well as the year of the bourbon. The results were quite surprising. Enjoy! 1. Pappy Van Winkle 20yr. Old Bourbon- 20 Points. 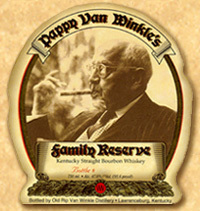 We found that this bourbon was the sweet spot in terms of the time Pappy should be aged in barrel. The color was a wonderful golden amber with a honeyed hue and a touch of rose’. The first nose gave off alcohol aromas some vanilla and slight spice. Initial tastings had vanilla, baking spice and oak with medium intensity. The mid palate was smooth and refined with oak vanilla and earthy characteristics. The finish was long, rich and continued with an interplay of spices, toasted oak and vanilla. An extremely balanced bourbon with a length that beats many I’ve tasted. 2. 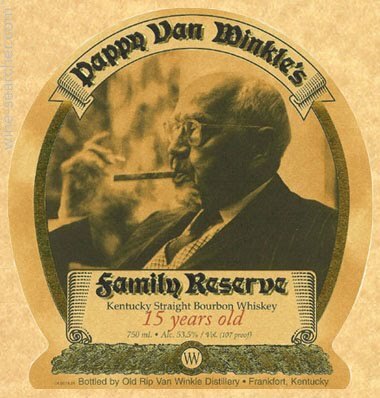 Pappy Van Winkle 15yr. Old Bourbon- 18 Points. The color in the glass was that of caramel and toasted almond. Nosing gave off aromas of cinnamon, citrus and spice. This bourbon had a weighty mouth feel with earth and vanilla dominating. Midway caramel, butterscotch and a bit of toasted oak came through. Some “bourbon heat” kicked in for a moment before finishing with a long caramel/toffee aftertaste. This was a medium intensity bourbon and we all felt it was a fine sipping spirit. 3. Pappy Van Winkle 23yr. Old Bourbon- 17 Points. The color on this bourbon was medium with an amber hue. There was a more intense burn on the nose with some vanilla coming through on the second impression. There wasn’t much more on the front of this offering. First sip yielded baking spice, wood and coconut. Midway gave a lot of earthiness along with baking spices and some more vanilla and caramel. There was a lot of heat present and the finish took on a long earthy and spicy character. This bourbon came on with intense spice, heat and wood no doubt due to its aging however we did not feel the extended time benefited it. So after a long hard afternoon which trickled into evening we concluded our findings. Having drunk these bourbons for years I wasn’t surprised to see the 20 yr. old the best in taste, flavor and finish as it has always been my personal favorite. We were all surprised to find that the 23yr. old scored the lowest in our tasting. This wasn’t a bad bourbon at all in fact it is of extremely high quality. The additional aging however seemed to overpower some flavors which seemingly hurt its scoring. 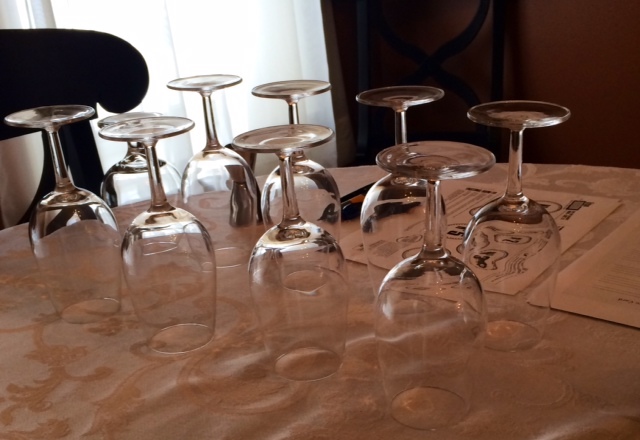 What makes blind tastings so interesting is that you remove your preconceived notions and are forced to focus on the sight, smell and taste of the product alone. I would recommend getting some friends together and try a blind tasting. It can be done with any spirit and you may be surprised at what you THINK you like. I’m sure you won’t have any trouble finding friends to lend a hand in this endeavor,I sure didn’t.